Students in the Department of English have other opportunities to extend their education, too. Studying abroad during a term or a full academic year is just one way to get more out of your studies at the UO. 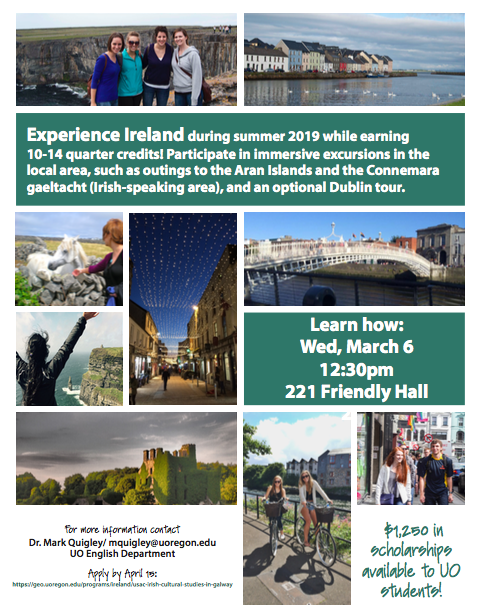 For instance, students can experience Irish literature and culture in Global Education Oregon's Irish Cultural Studies in Galway program, supervised by our own Professor Mark Quigley. The program features a rich array of classroom speakers, field trips in the West of Ireland, and opportunities to sample the delights of Ireland’s wonderful film and arts festivals. It also offers a variety of courses from all majors with emphases in history, music, theatre, literature, and Gaelic. Scholarship funds are available for students accepted to this program, including the Deborah Tims Ellis Endowed Scholarship, which is awarded each year in recognition of outstanding academic achievement by an English Major. In 2019, the scholarship winner can receive up to $1500 to support their participation in study abroad programs. Applications are due April 22, 2019. Please refer to this document for more information. For more information about the Galway program, please contact Professor Mark Quigley. For information about all study abroad opportunities at the University of Oregon, visit Global Education Oregon.